If I had a pound for every drum loop sample library that arrived at SOS Towers, it's fair to say that I wouldn't need to be sat here writing this review! However, Intravenous falls into the 'worthy of a closer look' category. 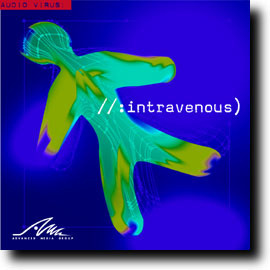 Supplied as a two-CD set containing both audio and WAV-file content, the underlying concept is "the creation of grooves that enter the bloodstream as fast as possible", hence the name Intravenous. Although I didn't find myself needing beta-blockers, there's definitely some great content here, and the artwork deserves a special mention for being among the most eye-catching I've seen. Rather than being just a collection of many hundreds of different loops, Intravenous contains 67 core loop categories, each one featuring different variations, such as dry, wet, with and without percussion, and so on. With tempos ranging between 70 and 135 bpm (plus one at 166bpm), most of loops are based on lively acoustic kit playing with a great feel and plenty of ringing snares and sparkling hats. You'll find plenty of creatively programmed processed material too, and most of the loops sound pretty cool, with enough power to drive most tracks. The last seven loops break from the 'four on the floor' tradition, providing material in 5/4, 7/8, and 6/8. I'm not sure if these 'feel' as good as the regular loops, but they're a useful addition. Another nice touch is the small collection of single hits and fills at the end of the second CD. I found a few of the loops to be slightly over-compressed, with the 'in your face' sound of having been processed by something like the Waves L1 plug-in. This makes the loops sound far better during auditioning, but occasionally makes mixing them in context much harder. I like to be able to add my own punch! Intravenous is a mid-range drum loop library that stands out from the crowd. Anyone who wants to inject a little more edge into their modern electronic-styled drum parts should find plenty of usable material. However, the biggest problem with a library like this isn't really the fault of the developers -- if you have some reasonably distinctive sounding loops, other users of the samples can spot them a mile off! In a sense, this made me reluctant to review the collection because I wanted to keep it to myself! A good thing? Maybe. A compliment? Definitely!